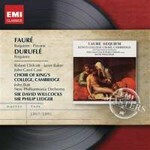 "This is the Faure Requiem to come home to. Its original reviewer in Gramophone was Alec Robertson, who declared that it had provided him with a very rare professional experience, the chance ''to describe a recording as near as can be to absolute perfection from start to finish''. A quarter of a century has passed, and the catalogue now has 25 other recordings currently available: many are fine, but this one has still not been overtaken on its own ground.